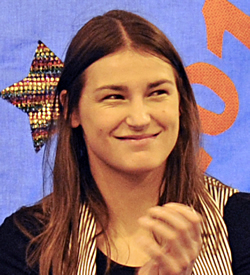 Katie Taylor is the youngest of the four children of the Taylor family, all of whom attended St Kilian's. Lee, Sarah and Peter are her older siblings. Katie is a household name throughout Ireland, having won an Olympic gold medal in women's Boxing (lightweight division) at the 2012 games in London. Katie has also won four World Championships and five European Championships in a glitterring career, where she has been described as the 'poster girl' for women's boxing worldwide. Katie has also been capped 15 times and scored two goals for the Irish women's senior football team. Since completing her Leaving Cert in 2005, Katie has maintained strong links with the school. After all of her major successes, she has returned to celebrate with the students and staff of the school.